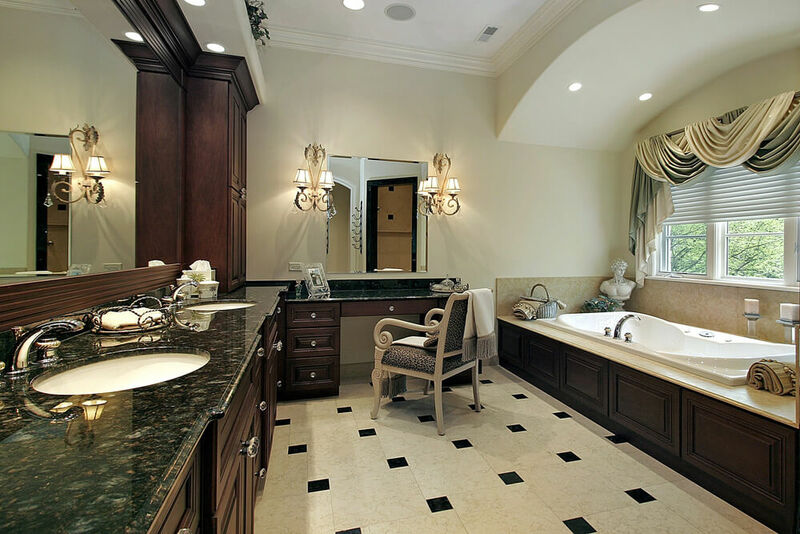 Welcome to our gallery featuring a collection of gorgeous bathrooms, each featuring an L-shaped vanity. 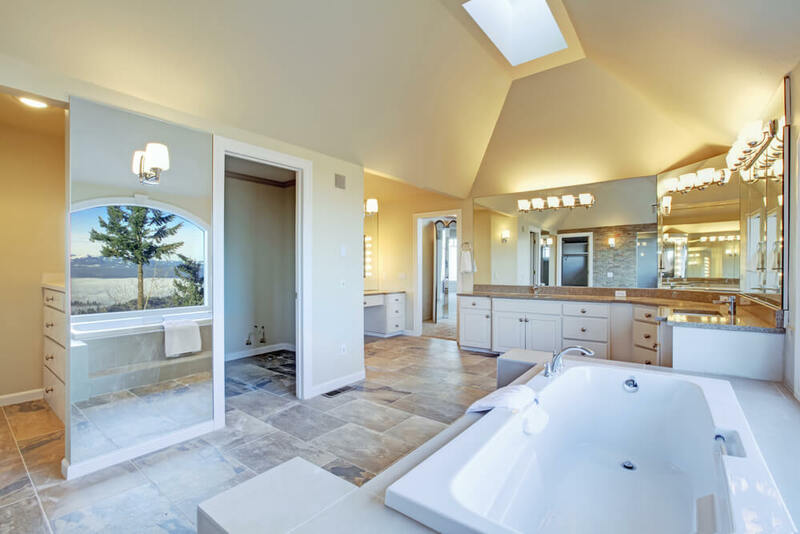 While it’s commonplace for bathrooms to have more than one vanity, some bathrooms just aren’t quite large enough to accommodate two sinks with separate vanities. 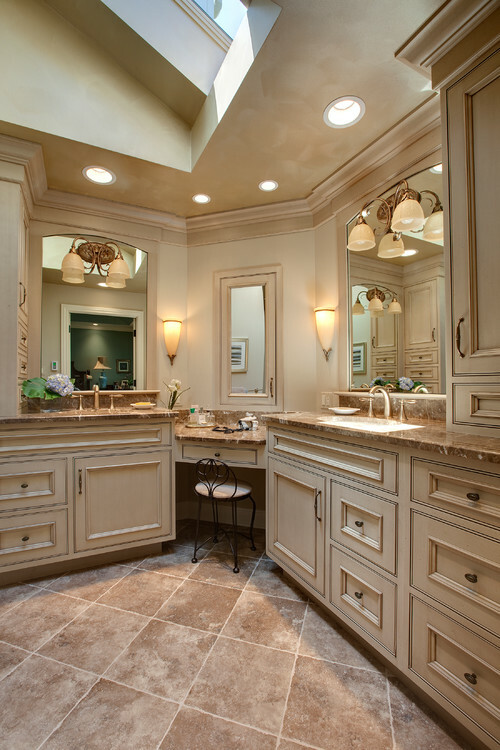 For these types of bathrooms, or for those with only a free corner, an L-shaped vanity may be the best solution. Whether that extra space is used as a makeup vanity or as a second hand-washing station, an L-shaped vanity is sure to offer more utility than a single vanity. And while it’s a bit of an unusual fixture in most spacious bathrooms, it’s perfect for fitting into tough corners and utilizing space. 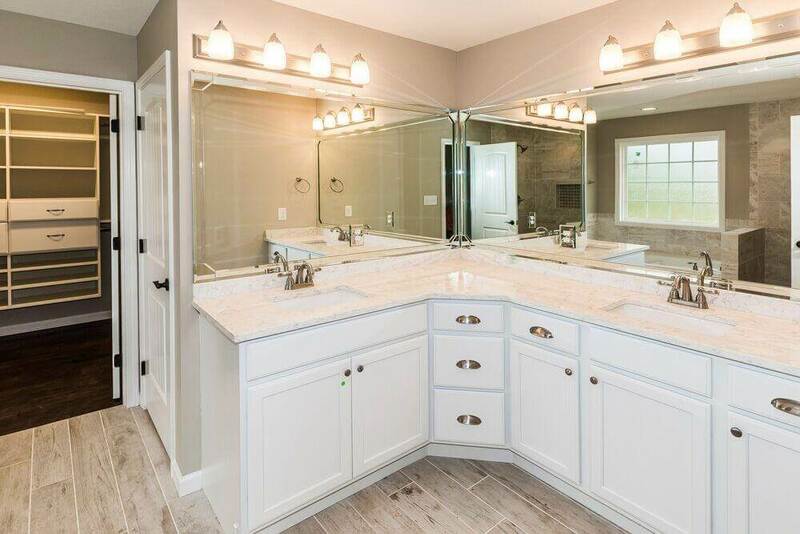 It’s been said that in smaller bathrooms, having two sinks on a L-shaped vanity can lead to a bit of cramped personal space, should more than one person be at the sink. You’ll notice that many L-shaped vanities don’t have two sinks. Many times they’ll have a makeup vanity attached, or use the extra space for storage. Regardless of whether the L-shaped vanity is minimalist or ornate, the shape is definitely one to consider. For oddly shaped rooms, even the lazy-L shaped vanities work well. Lazy-L refers to a shape that isn’t fully an L, but is very similar. 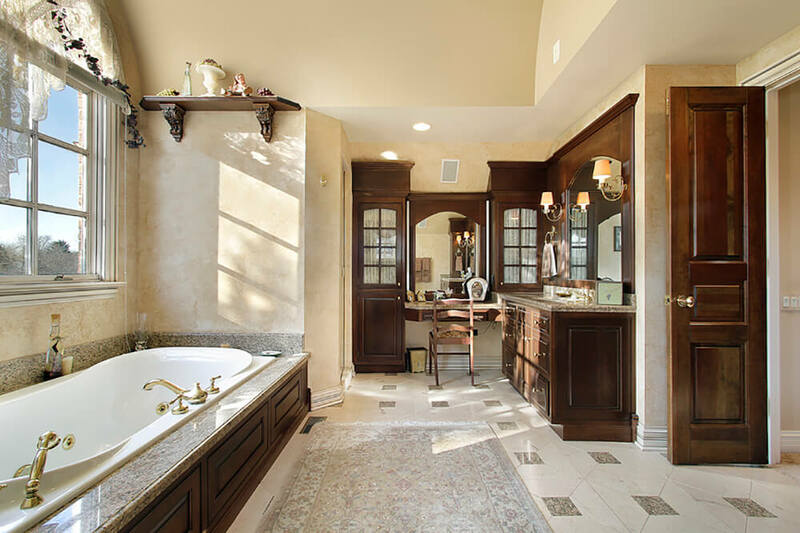 We hope you’ll enjoy this gallery filled with unique and luxurious master bathrooms; with L-shaped vanities, of course. 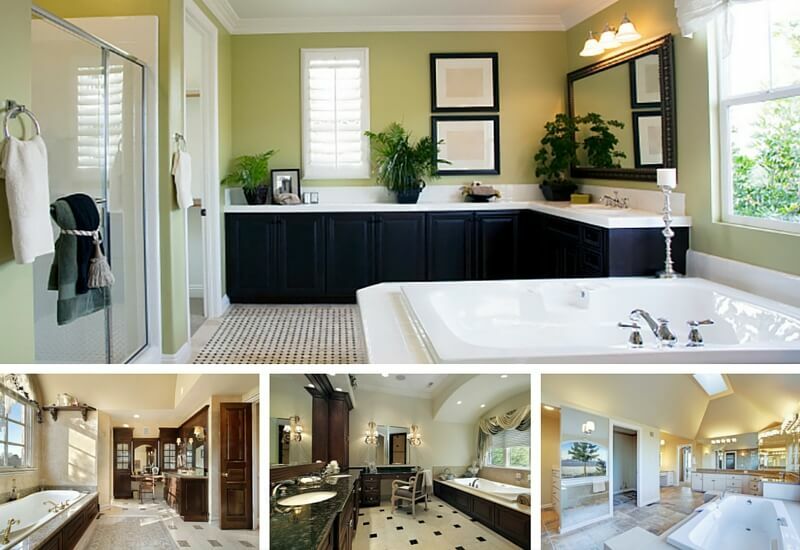 The soft spring green on the walls brings some much-needed color into the black and white master bathroom. 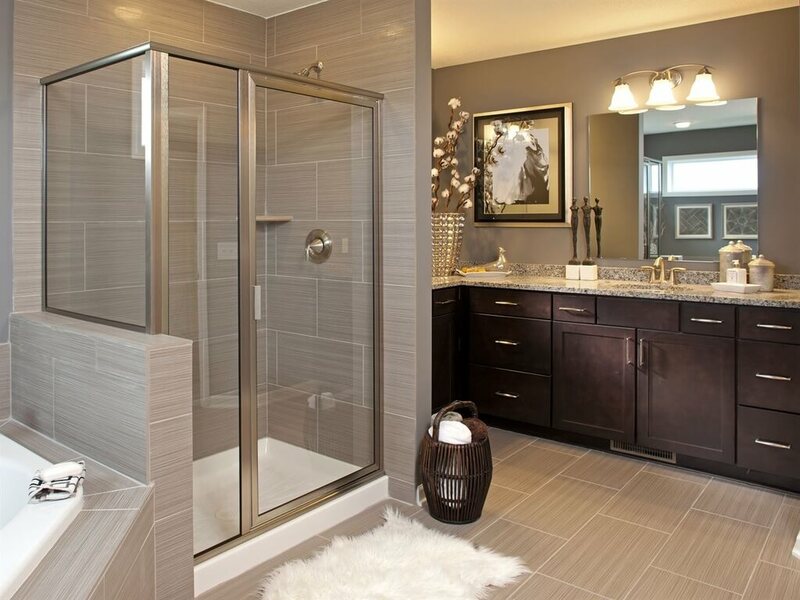 This bathroom features a large walk-in shower in addition to a soaking tub. A beautiful, elegant master bathroom with a gilded soaking tub beneath a window bedecked in lace. In one corner is a dressing table and vanity complete with linen cabinets. 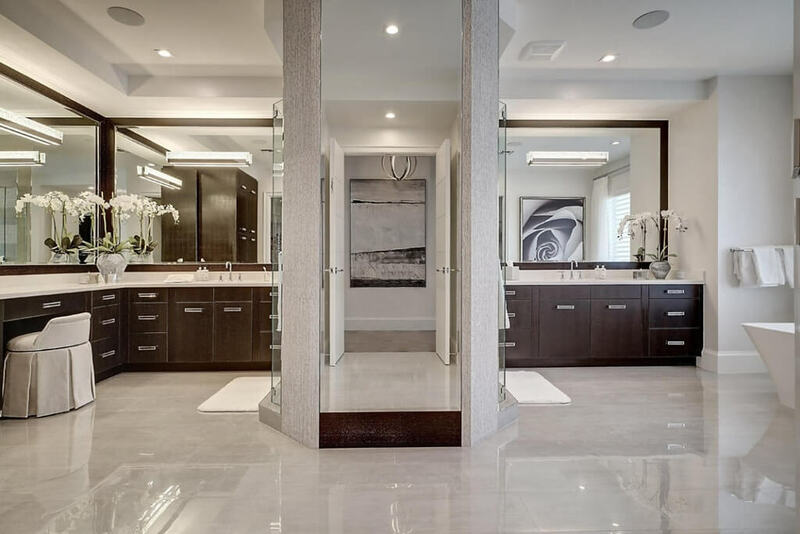 This contemporary bathroom features a large mirror, frosted glass-faced cabinets, and two sinks, one on either side of the L-shaped vanity. 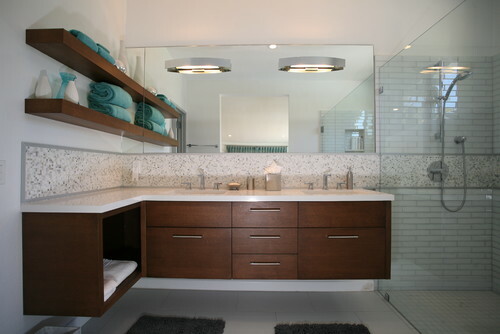 Contemporary Bathroom by Austin Interior Designers & Decorators Susie Johnson Interior Design, Inc. The tile floor of this luxurious master bathroom is full of colors and textures that correspond to various other accents in the space. 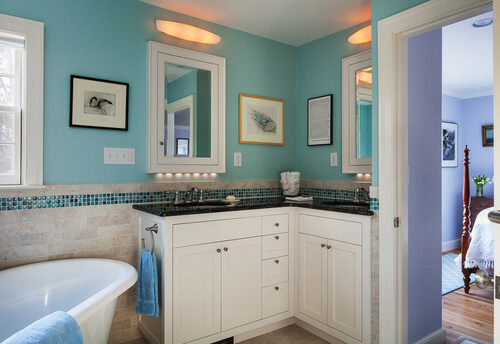 The bright robin’s egg blue of this bathroom is complemented by the toned down cabinetry and pitch black countertops on the corner vanity. 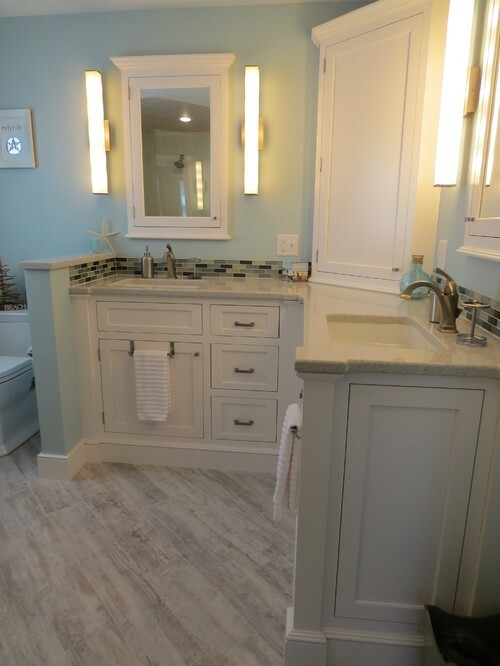 A floating vanity is a great look for modern bathrooms, and the wood corresponds with the trim around the window, adding color and warmth to the otherwise white bathroom. Glass block sections in this bathroom obscure the view into the bathroom, preserving privacy, but also allow light to still filter in from the adjacent room. Marble-effect tilework throughout this bespoke bathroom makes the deep, rich color of the L-shaped vanity really stand out. Note the massive walk-in glass shower. This is a more standard walk-in shower, surrounded by the same large-format tile as the soaking tub near by. The space is accessorized with cotton stems in a metallic dimpled vase. The soft blue and greens of this bathroom compliment the white vanity, which has a tall medicine cabinet in the center of the L-shape. 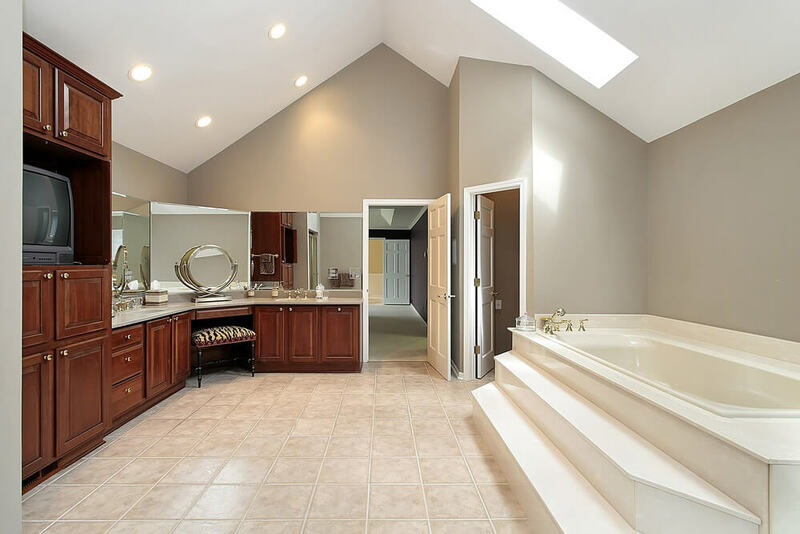 A skylight in a bathroom is an impressive feature that filters plenty of light down into this massive bathroom. Mirrored doors section off the closets. 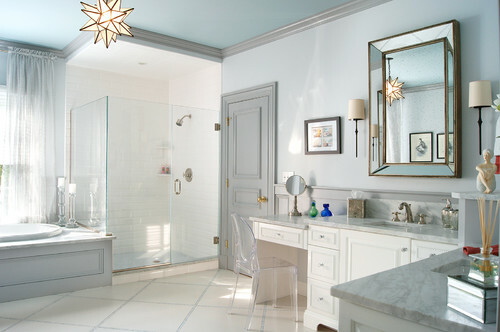 The globe-like light fixtures in this master bathroom are a show-stopper. 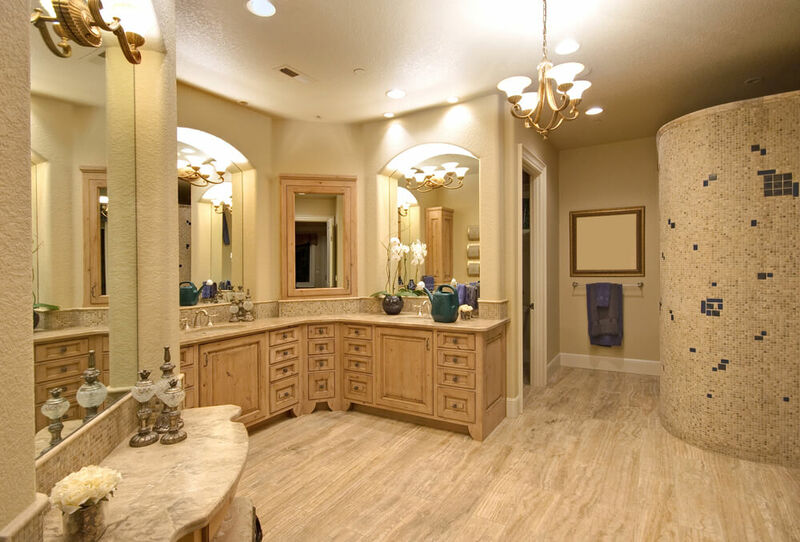 The intricate scroll work fits perfectly in this elegant bathroom design. 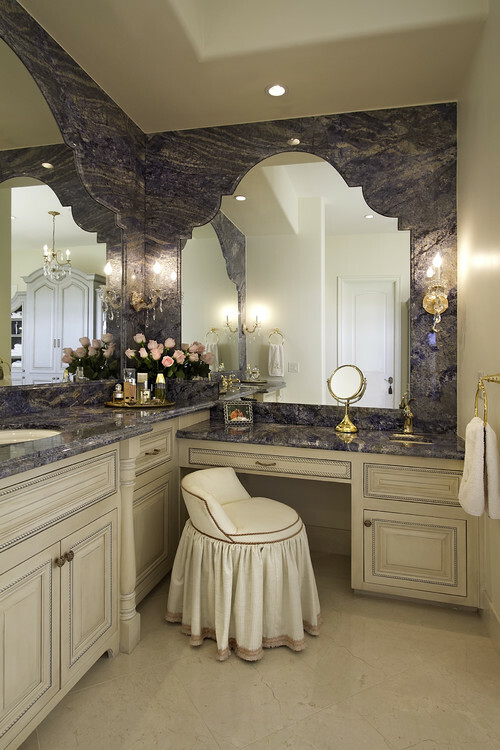 Rich tones in the granite countertops and textures in the drapery lend this bathroom an atmosphere of opulence. 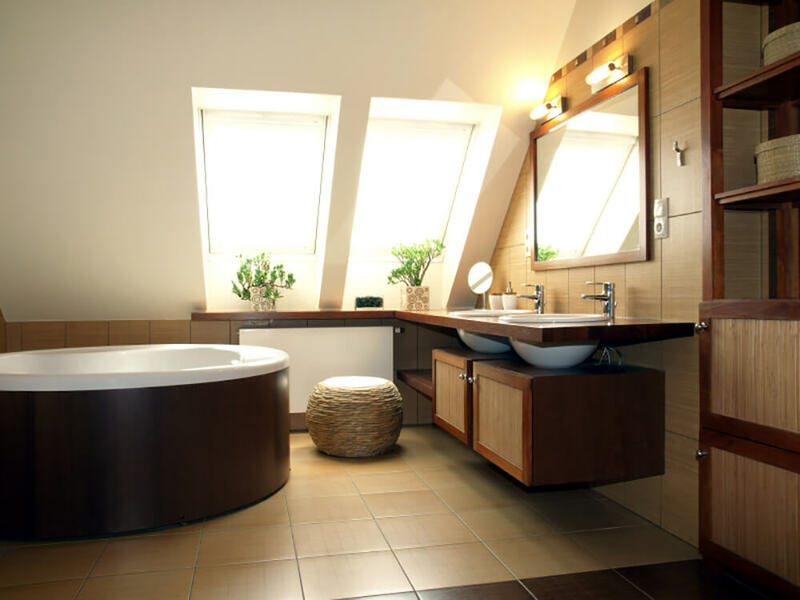 Again, we can see how skylights filter light into a spacious bathroom. This space has layers upon layers of lighting, including sconces, wall lights, and even recessed lighting. 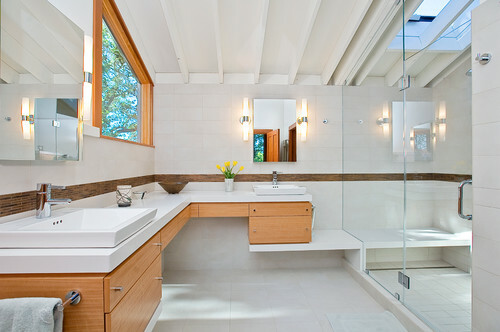 The simple white vanity of this bathroom is a great contrast to the wood-look tile flooring that leads into the closet. The combination of subway tile and small format tiling in the shower is in gray, a particularly popular neutral these days. The gas fireplace next to the soaking tub is a particularly nice addition. A set of steps lead up to the large soaking tub. The bathroom even includes a television, so the owners can enjoy a bath and catch up on their favorite shows. 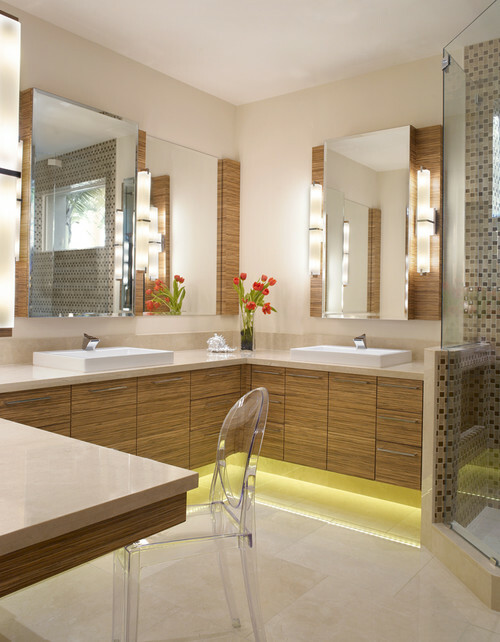 This beautiful contemporary bathroom features a unique star-shaped light fixture and a large glass walk-in shower. Marble countertops complete the design. 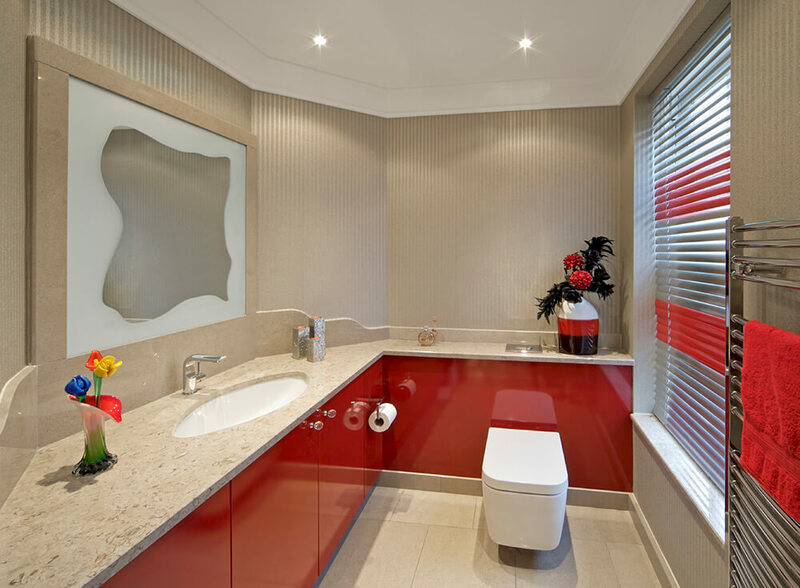 Bold red in this rather small bathroom provides a stunning contrast to the cream walls and countertops. An L-shaped vanity allows for storage behind the commode. Packing the shower between the vanity and the soaking tub is a clever way to save space, especially when space is at a premium. Keeping the color palette light and bright helps keep the space feeling open and airy. Open shelving in a bathroom is the perfect spot to store a few odds and ends, including rolled towels for that “spa” look. Subway tile in the shower is classic and simple. Encasing a bathtub in tilework is a great way to add cohesiveness to a design. The L-shaped vanity takes full advantage of an odd space in this unusually shaped bathroom. This bathroom is separated in the center by a walk-in shower. One side is a dressing room and makeup vanity, while the other serves a more traditional bathroom function. 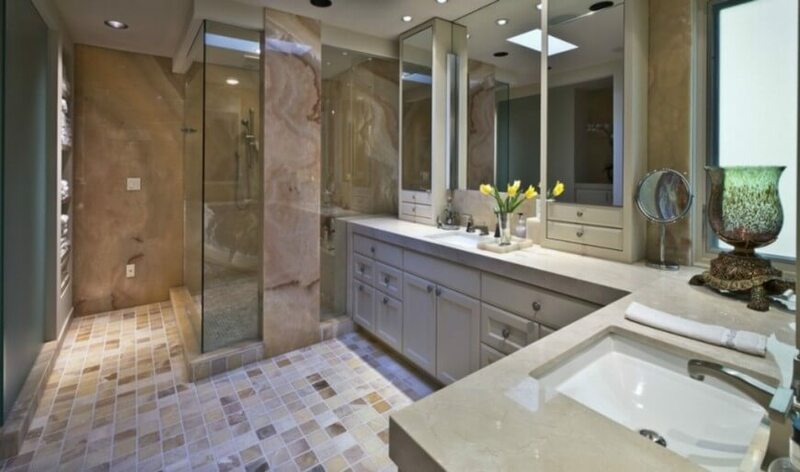 This ultra-feminine bathroom features mirrors embedded in an extension of the purple and cream granite that forms the countertops. A curved shower is an easy way to keep water contained in one spot, particularly in an open-concept bathroom. 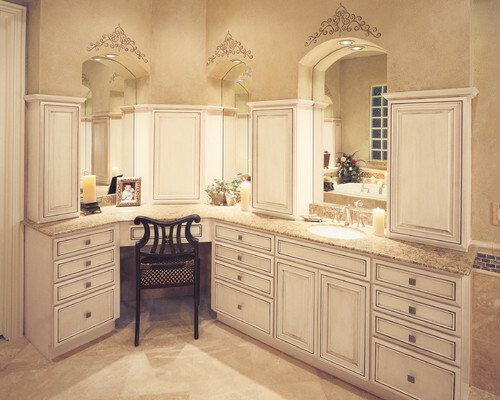 Light wood vanities are paired with arched mirrors. The grain of the minimalist vanities, paired with the crisp white of the vessel sink makes this bathroom a model of minimalism. 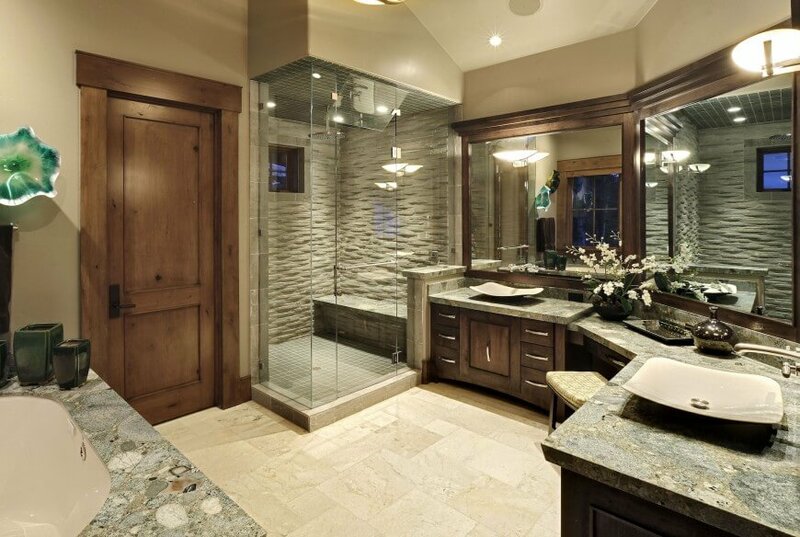 Textured stone in the shower and natural stone countertops add to the rustic appeal of this bathroom. More elegant elements, like the vessel sinks, balance out the rustic charm. Designed by Jaffa Group. Photography by Scot Zimmerman. Stencils above each mirror resemble tiaras in this traditionally feminine dressing room, part of a large master bathroom. 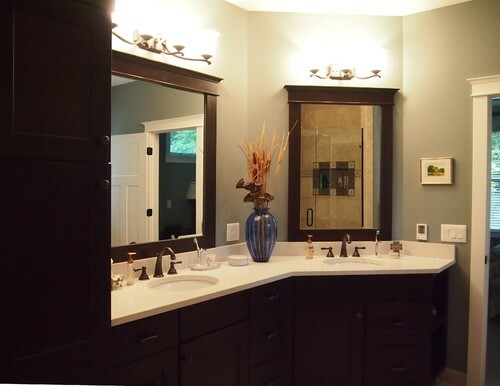 In smaller bathrooms, an L-shaped vanity can extend the space just enough to have space for a second sink.